Did you get your CEC electronic ballot on Tuesday of last week? If you are a member of CEC you should have gotten a ballot with the slate of officers which included the president elect, treasurer and various board of directors. Though you have until October 28 to vote, why not do it now? We all get so busy with putting out fires, time can slip up on us. We need everyone to vote. Speaking of elections, CASE will be electing a new president elect and treasurer in February 2014. CASE past president, Dr. Mary Kealy is working on that slate now. If you are interested in either of those offices, click here for the nomination form or go to the CASE website to download both the job functions and the nomination form. All forms are due in by Dec. 31. Did you know your Executive committee is comprised of special education administrators from Michigan, Massachusetts, Virginia, North Carolina, Indiana, Iowa, Alabama, Georgia, Wisconsin, Arizona, Missouri and Pennsylvania? Through our committee structure, even more states are represented! Every voice is important. If you are interested in serving on a CASE committee, click here for a Committee Nomination form and description. 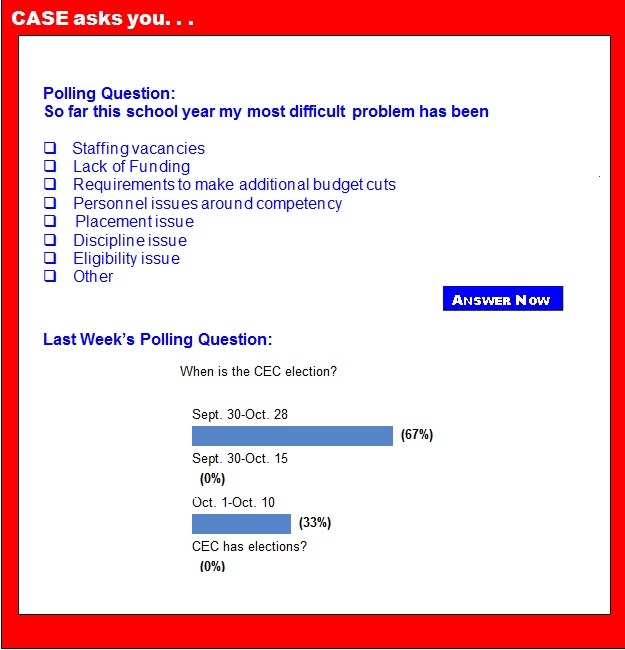 CASE tries to provide a multitude of ways for our members to provide input to the leadership — surveys, focus groups, BOD discussion, etc — this is your organization, be sure you are engaged so you can impact the outcomes for CASE and therefore improve outcomes for all students! "I don't know what your destiny will be, but one thing I do know: the only ones among you who will be really happy are those who have sought and found how to serve." — Albert Schweitzer, philosopher, physician, musician, Nobel laureate (1875-1965). If you missed the CASE fall conference last week in Indianapolis, you missed not only great, informative key notes, terrific breakout sessions, and amazing networking opportunities but also some incredible fun! Angie Balsley from ICASE organized a great Flash mob with a purpose ... one that culminated with the Indiana Yes I CAN Award winner speaking to the group ... Take a few minutes to watch this and it will affirm you! It portrays the support we have for each other as we work (sometimes against all odds) to support our kiddos. Donna Lehmann rocks the dance moves! It brings us back to the reason we all do what we do~ for our students! It features Mickey and "dang it", Mickey is just AMAZING!!! Click here for a great 11 minutes of fun, encouragement and joy! Sept. 30, the Obama administration approved a waiver for the state of Texas from the Elementary and Secondary Education Act, better known as No Child left Behind, in exchange for state-developed plans which will help prepare students for college and careers, as well as provide aid for students in need, and support effective teaching and leadership. Sept. 30, the U.S. Department of Education awarded $4.6 million in grants to five institutions for research aimed at improving the lives of people with disabilities. These grants are being awarded under the Rehabilitation Engineering Research Centers program. Advanced research will be conducted through engineering and technical means designed to apply technology, scientific achievement, and psychological and social knowledge to solve problems and remove barriers. Brokedown Congress appears likely to spend the weekend attempting to keep the government from shutting down and the U.S. from defaulting on its debt. The sticking point this time isn't schools. Given the increase in students diagnosed with disabilities and the costs involved in serving them, district leaders who want to provide the proper instruction and care, and avoid costly litigation, must stay abreast of the law. About 1 in 6 students are now diagnosed with a developmental disability, according to a 2011 study in the journal Pediatrics — a 17 percent increase between 1997 and 2008. And prevalence of autism increased nearly 290 percent during that time, the study found. Best practices for avoiding adversarial relationships between school districts and parents are presented. Don't rely on one source of information about your preschoolers' inattention or hyperactivity. Rather, consider how your child behaves at home as well as information from his or her teacher and a clinician. This advice comes from Sarah O'Neill, of The City College of New York, based on research she conducted at Queens College, in an article published in Springer's Journal of Abnormal Child Psychology. The study examines how well parent, teacher and clinician ratings of preschoolers' behavior are able to predict severity and diagnosis of attention deficit hyperactivity disorder at age six. The family and educator's work in helping a child build empathy to others cannot be underestimated as key to not only that child's outcomes, but the outcomes of a peaceful society overall. Conversations and proposed solutions abound for the end to bullying in our schools. Programs are presented. The children may be given "trainings" and "preventions." When it comes to children's learning, are we focusing too much on schools — and not enough on parents? "There is, quite rightly, a cacophonous debate on how to reform schools, open up colleges, and widen access to pre-K learning," notes a new article, "Parenting, Politics, and Social Mobility," published by the Brookings Institution, a Washington think tank. "But too little attention is paid to another divide affecting social mobility — the parenting gap." As Congress struggles to pass a budget stopgap measure, advocates are stepping up their fight against sequestration — the series of across-the-board cuts to federal programs that hit last March and are slated to stay in place for a decade unless Brokedown Congress acts. The districts hardest hit by these cuts? The roughly 1,200 that receive federal Impact Aid. Those are typically districts that lose out on tax revenue thanks to a federal presence, such as a nearby military base or Native American reservation. Looking for similar articles? Search here, keyword SEQUESTRATION. A key U.S. senator is pressing for a quarter-million more young people with disabilities to be employed by 2015. In a new report, Sen. Tom Harkin, D-Iowa, says that public and private sectors should come together to grow the number of young workers with disabilities by 250,000 in the next three years. "The enactment of the Americans with Disabilities Act, 23 years ago, helped grant the promise of equality to Americans with disabilities. But today, more work remains to be done to knock down one of the last remaining barriers — the gap in workforce participation that exists for millions of young adults," Harkin said. A new logging bill passed by the U.S. House of Representatives means rural schools in timber-rich areas likely would see cuts to their education funding, but education advocates still supported the measure because it offered a long-term funding solution for those schools. The Secure Rural Schools and Community Self-Determination Act has given rural communities in national forest areas federal money to compensate for revenue lost because of restrictions on harvesting timber. School districts have relied on that money for decades, but the legislation expired last year. It was reauthorized last summer for one year, and this site gives a state-by-state breakdown of the funding (Oregon leads the pack with $63 million, followed by California at $35.8 million). The U.S. Department of Education announced today the award of more than $4.6 million in grants to five institutions for research projects aimed at helping improve the lives of people with disabilities. The grants are being awarded under the Rehabilitation Engineering Research Centers Program. The recipients will conduct programs of advanced research of an engineering or technical nature designed to apply technology, scientific achievement and psychological and social knowledge to solve rehabilitation problems and remove environmental barriers. Brokedown Congress appears likely to spend the weekend attempting to keep the government from shutting down and the U.S. from defaulting on its debt. The sticking point this time isn't schools. Instead, education is getting caught in the crosshairs. Republicans want to defund, or at least delay implementation of, the president's landmark health care overhaul law (the Affordable Care Act to its fans and "ObamaCare" to its critics). On bmj.com, a visiting scholar at the Feinberg School of Medicine suggests that mental health screening is carried out in primary schools to enable early identification and potentially save money. In a personal view, Dr. Simon Williams agrees with a recent BMJ study which suggests that further research of cognitive behavioral therapy programs in schools is required. He also believes that school is the most appropriate setting for the identification of mental health problems in younger children. He says there are "great benefits to be had from the provision of routine mental health checks for all schoolchildren" and a "more standardized approach would be more equitable and effective." The summer learning backslide: Does your child lose skills? Across America, students from kindergarten to 12th grade are back to school. While teachers and students alike will miss their summer freedom, teachers most lament the loss of skills students had mastered just a few short months earlier. It's as if too much time on the waterslide resulted in a learning backslide. The old adage says, "Use it, or lose it," and research supports this wisdom as it applies to the loss of student skills over summer break. Barry Schwartz, a contributor for Slate, writes: "There is no doubt that 'diminished attention' is a correct diagnosis of the intellectual temperament of our age. I see it to a greater degree each year even in the students I teach, who are among the very best that our high schools have to offer. But how to treat it? Again and again, we are told in this information-overloaded digital age, complex and subtle arguments just won't hold the reader's or viewer's attention. If you can't keep it simple and punchy, you'll lose your audience. What's the point of having a New York Times article about the U.S. stance toward the Syria that continues on an inside page if nobody is going to turn to the inside page?" With school back in session, curriculum directors, teachers and students are eager to begin the new school year armed with tools for learning in the classroom and mastering concepts at home. Homework help resources can aid students and parents as they work through math assignments, craft essays and more.